The First Amendment of the United States Constitution is contained in the Bill of Rights. The First Amendment has proven to be one of the most fundamental and important Amendments with respect to the rights attributed to the populace of the United States. Originally, the First Amendment was implemented and applied solely to Congress. However, by the beginning of the 20th Century, it was upheld that the First Amendment is to apply to all forms of government, including at the state and local levels. The Supreme Court decided that the Fourteenth Amendment Due Process Clause would apply to the 1st Amendment, and thus, rendered such a decision. 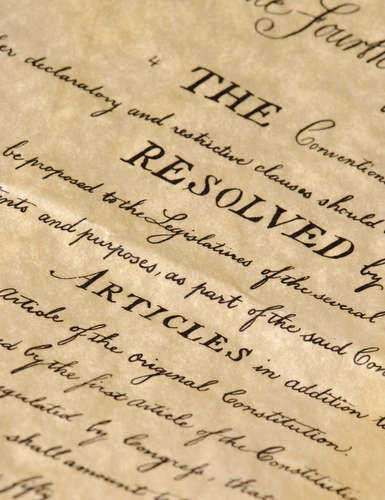 As stated in the United States Constitution, "Congress shall make no law respecting an establishment of religion, or prohibiting the free exercise thereof; or abridging the freedom of speech, or of the press; or the right of the people peaceably to assemble and to petition the Government for a redress of grievances." Though a relatively short and concise assertion, the text provides for quite an encompassing set of rights that protect the citizens of the United States and some of the most important and basic human rights. The First Amendment has many clauses that relate to each of the concepts that it sets out to protect. Religion is discussed in two Clauses: one regarding the establishment of religion and the other the free exercise of religion. This proves to be one of the most important rights to secure by the Fathers of the Constitution, for so many people of European descent immigrated to the American Colonies to avoid religious persecution and find a safe haven to practice their religion of choice without any dire consequences. The First Amendment prohibits the government to establish a formal or national religion for the nation. It also addresses that there will be no preference for any particular religion, including the practice of no religion, or non-religion. The 1st Amendment guarantees the people of the United States the free exercise of religion without interference from Governmental factions. This right would also extend to any organization or individual infringing upon such right, and would be deemed as unconstitutional.